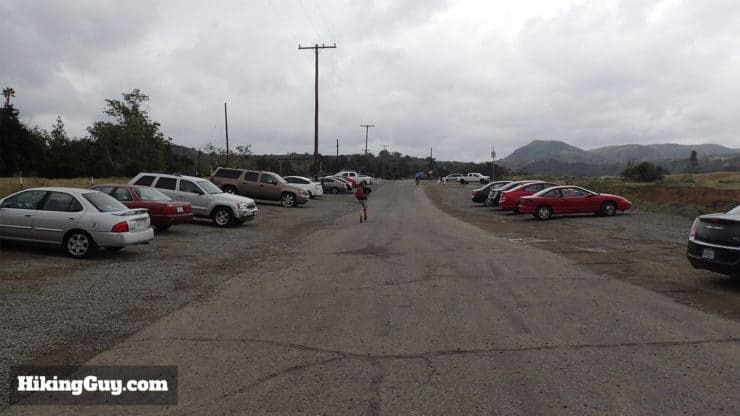 The trailhead is easy to find and has lots of parking. 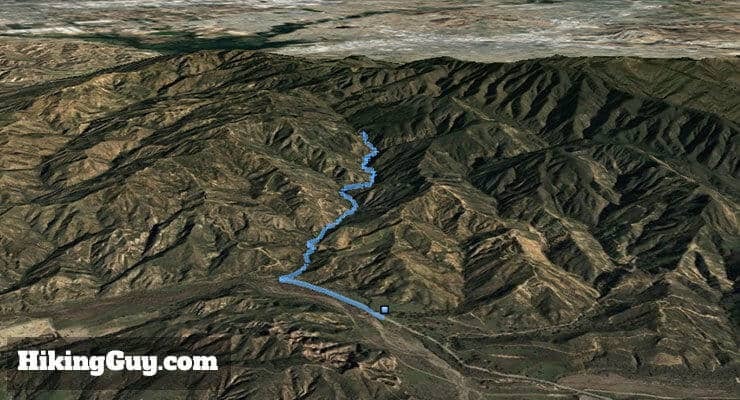 Here’s the address to use: 13333 Black Star Canyon Rd, Silverado, CA 92676, USA. 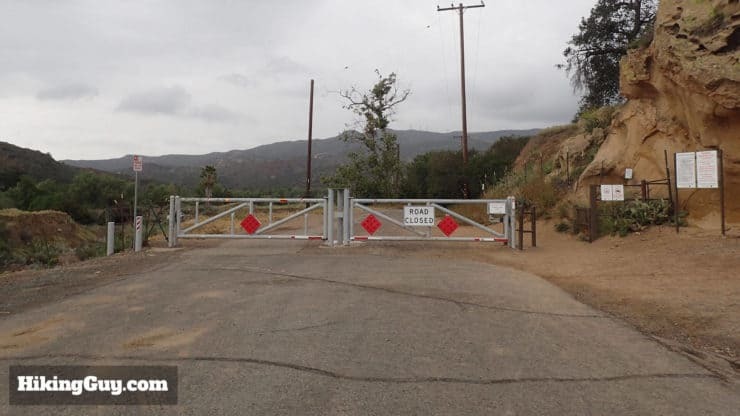 There’s plenty of parking at the Black Star Canyon trailhead. It’s a popular hike though, and I’ve seen the lot full. Note: There are some road closures, check out this link and call the ranger station to ensure that you’re good. This is typical of the last section of the hike. 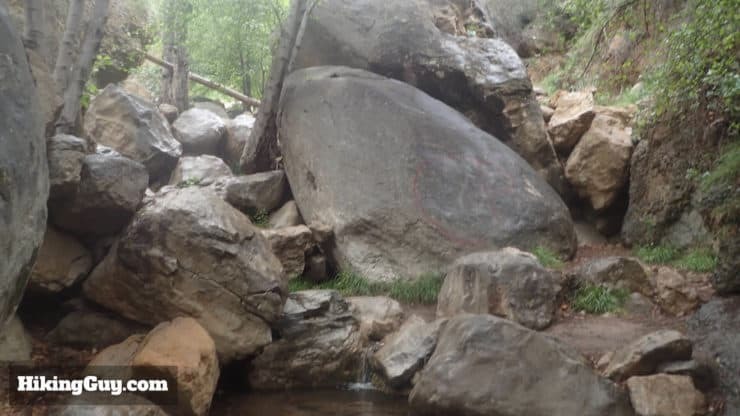 You’ll be making your way up boulders through Black Star Creek. 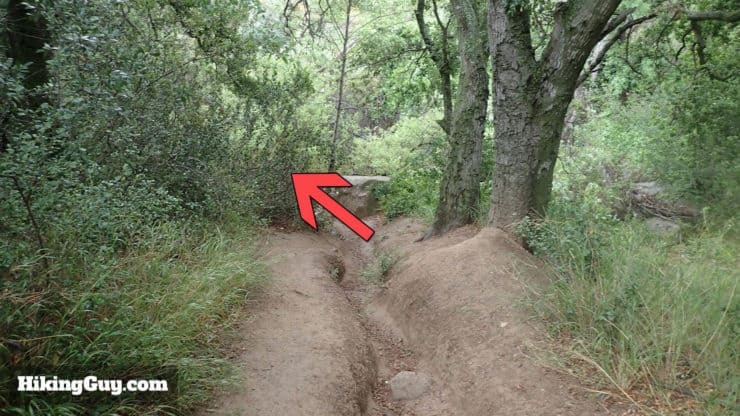 There are really two parts of the trail on the hike up Black Star Canyon. 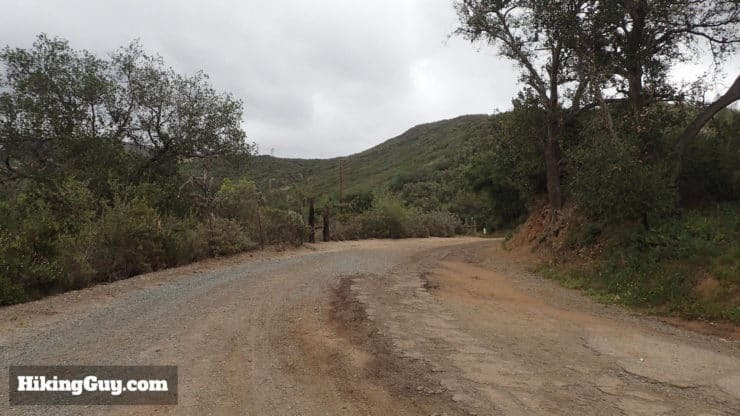 The first half is on dirt roads and is very easy. You could do it in sneakers. The second half follows the Black Star Creek bed and is much slower going. There are sections where you walk through water and mud. Toward the end of the hike, you have to pull yourself up rocks and boulders. It’s doable, but slow going. 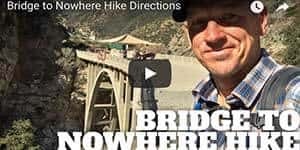 The second half is definitely not a traditional trail hike, so here’s the gear that I recommend. 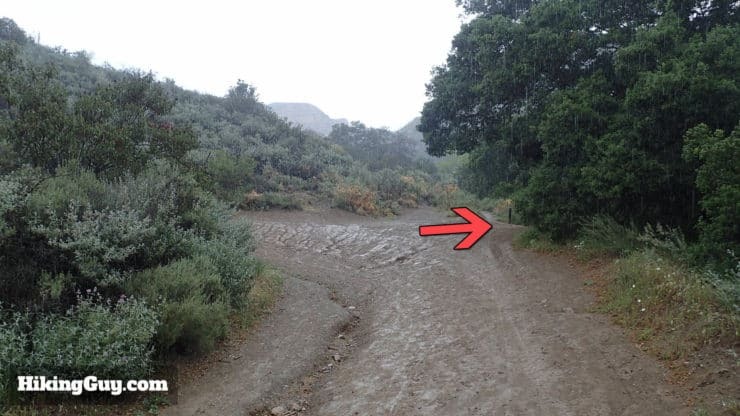 If it’s raining out when you do this, expect to go through some water as you hike up along the stream bed. You will get wet. And usually the falls are best when it’s raining or just has rained, so yea, just plan on getting wet. I usually hike in shorts but it pays to hike in long pants and long-sleeves here; there’s a lot of poison oak along the trail. I’ve seen plenty of people with dogs on this hike, but they’ll have to get up and down the boulders too. They should be comfortable jumping up and down, or you should be prepared to carry and lift them. 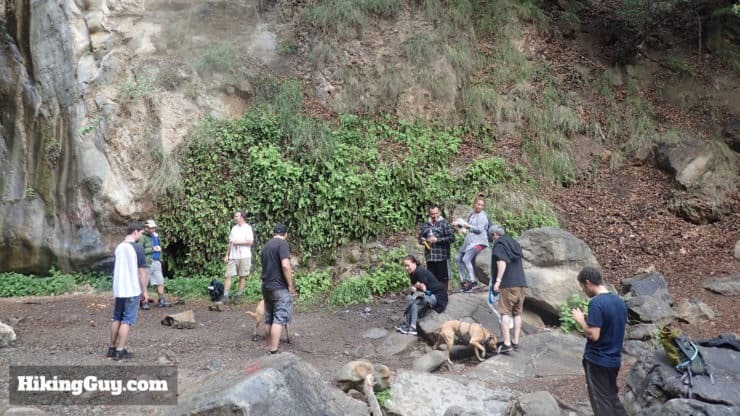 Many folks put booties on their dogs for the hike because of sharp rocks. 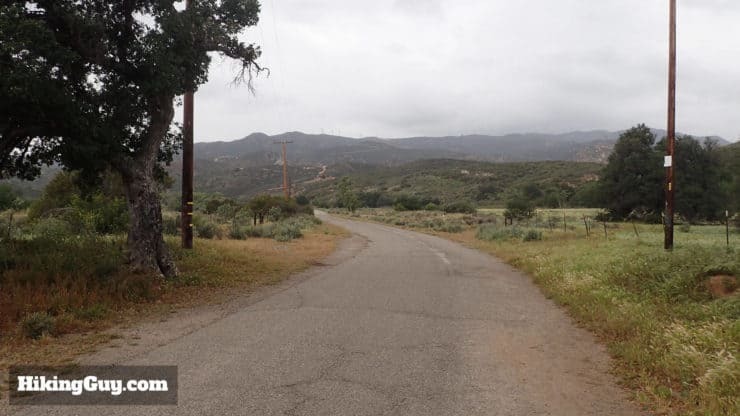 Why is Black Star Canyon Haunted? 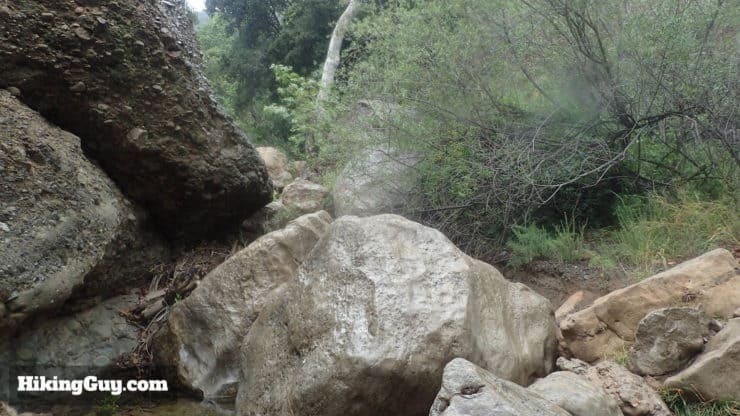 Check your hike pictures for any orbs or anomalies. Maybe the orb was a ghost, maybe just weird lighting. Photo from Terra Umbra. 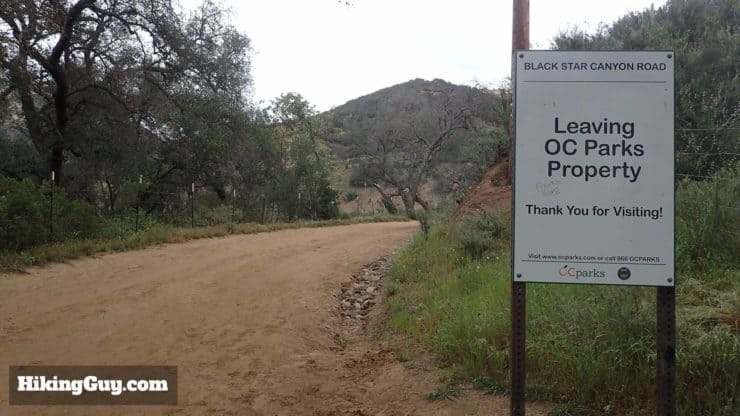 There are a few ingredients to the Black Star Canyon haunting story. Let’s start at the beginning. 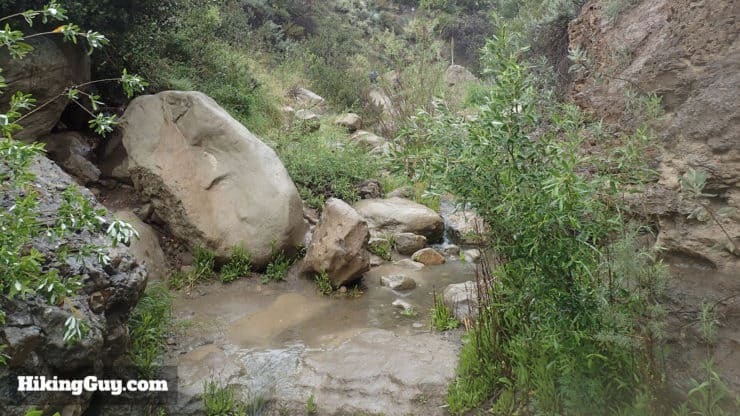 This area was the original home of the Tongva peoples, and there are signs of their habitation, such as ‘pothole’ grinding rocks, in the area (although I have yet to spot any). 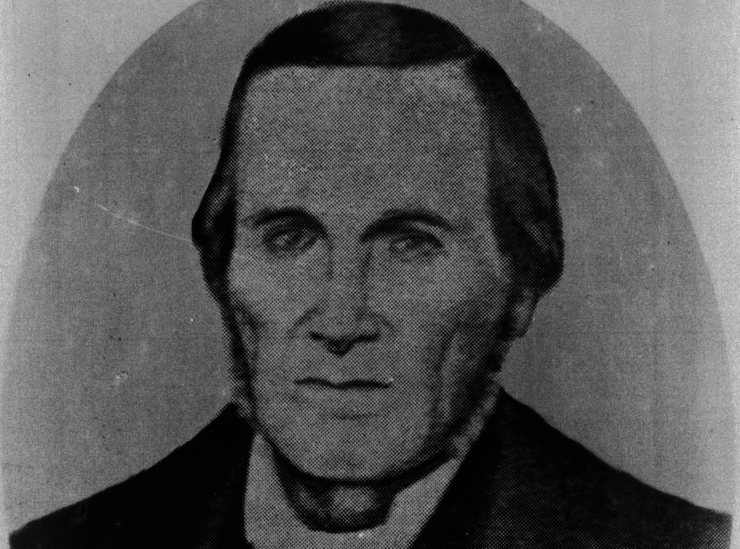 In 1831, William Wolfskill led a group of fur trappers to Black Star Canyon in search of their stolen horses. Finding the horses with the Tongva in Black Star Canyon, the trappers massacred the Tongva in a “rifles versus bow-and-arrow” battle. The canyon is said to be haunted by those massacred. After massacring the Tongva, William Wolfskill went on to become one of the wealthiest men in America, credited with starting the citrus industry, inventing the Valencia Orange, and producing 50,000 gallons of wine a year. 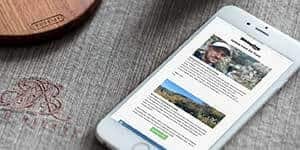 The canyon is named after the Black Star Coal Mining Company, which opened a mine at the mouth of the canyon in 1877, but shut down in the early 1900s. 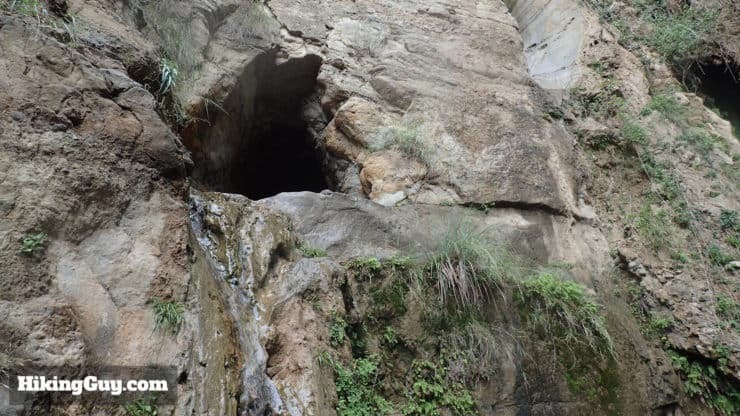 The lower tunnel in the falls is actually an old mine shaft. One of the apparitions “most sighted” is referred to as “the Miner” and evidently worked the mine. In 1899 Black Star Canyon was the scene of another murder, this time as a result of friction between Mexican and Anglo-American homesteaders. 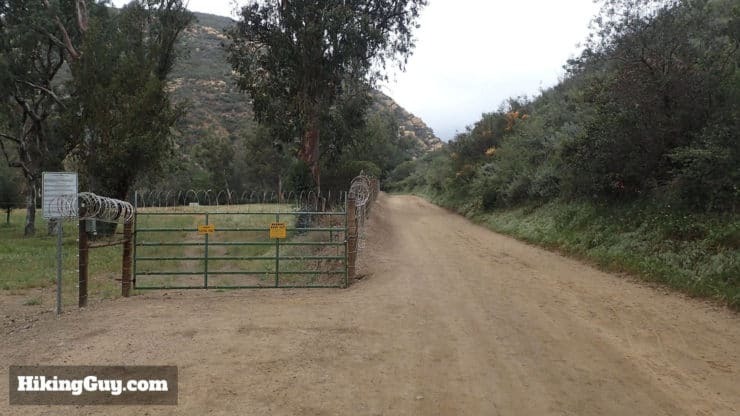 So in addition to the murders and massacres, Black Star Canyon is also a traditional spot for teens to come and party over the years. You can imagine combining the stories of past massacres with drugs, alcohol, and darkness, and you have a recipe for a haunted reputation. 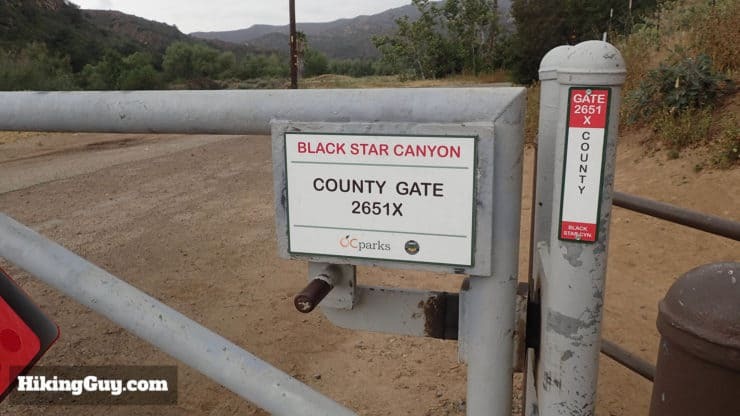 Today the local tall-tales about Black Star Canyon have evolved into it being a place for satanic cult meetings, shadows that follow you, KKK meetings, a crazy homeless guy named Black Star Bill, and locals who will shoot at you. 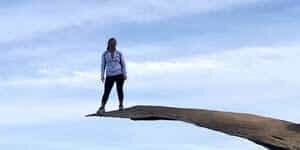 After having done this hike numerous times, I can safely say that I’ve encountered none of those phenomena. 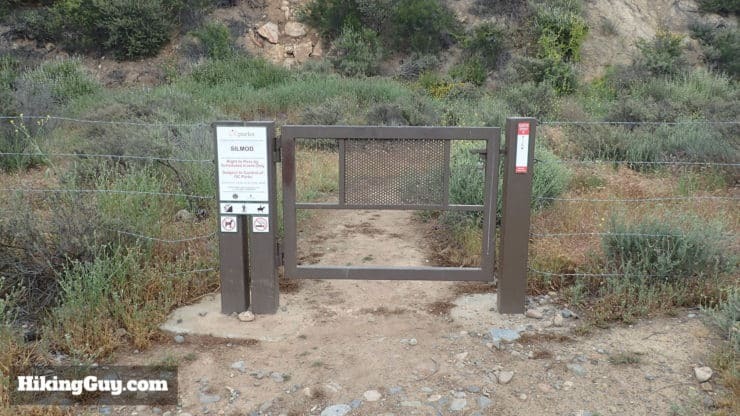 Just stay on the well-marked trail for the first part of the hike, avoiding the fenced off private property, and you should be fine. 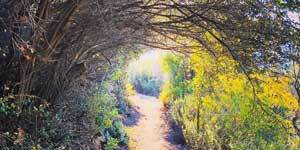 There are guided hikes at Black Star Canyon around Halloween, and it’s also a popular spot for local ghost hunters. If anything, expect loud teens. Don’t be surprised if you get to the falls and encounter kids playing music, smoking cigarettes, and drinking beer. It’s not a dangerous hike in that way, but the crowd can be mixed. Some people love the hike, others hate it. 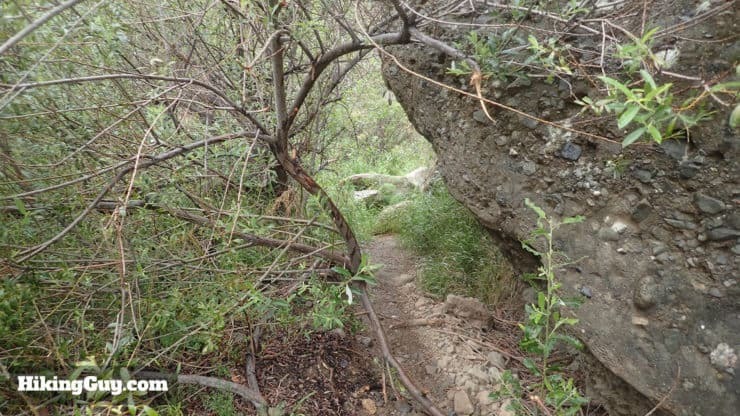 The trail gradually climbs up along Black Star Canyon. 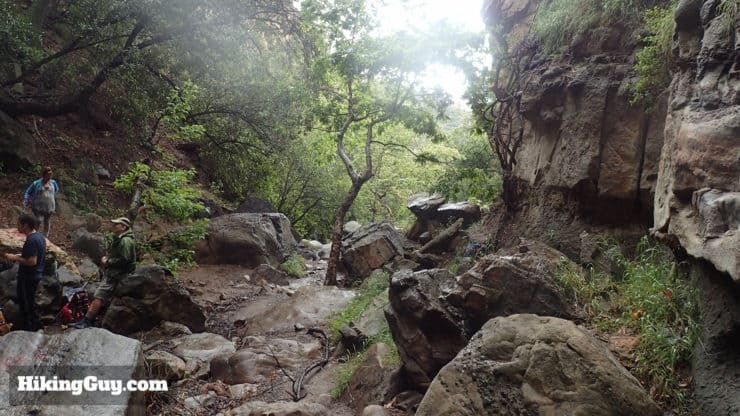 No big climbs on this one, but there are boulders to pull yourself up towards the end. 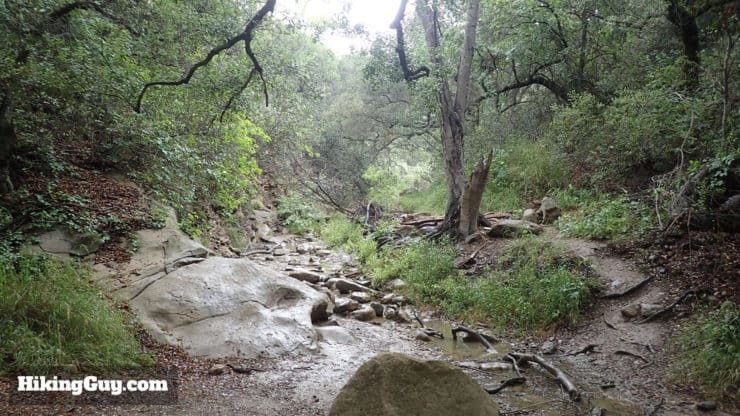 It’s an uphill hike, but the challenges of the stream bed hike distract you from the uphill effort. The last section to the falls has some areas where you have to haul yourself up the boulders. Keep you’re eyes and ears open for mountain bikers on the first half of the hike. It’s a popular spot for them. Once you’re on the smaller trail along the stream, you won’t see any bikes. 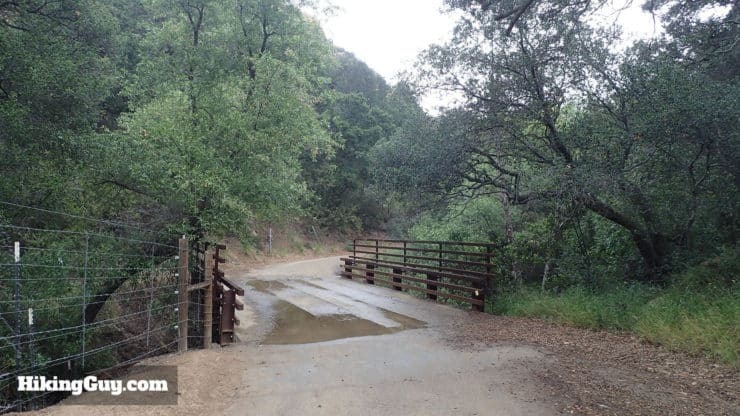 At the end of the lot, the road dead ends into a gate. Start hiking past the gate. The sign on the gate tells you that you’re in the right place. 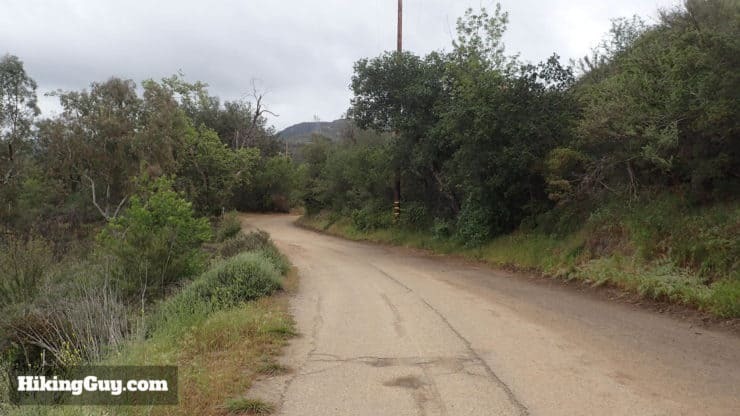 The beginning of the hike is on a paved road. Keep hiking straight and enjoy the view of rolling valleys. Avoid any side trails and stay on the main road. At about 0.6 miles the road comes to a T, make the right. 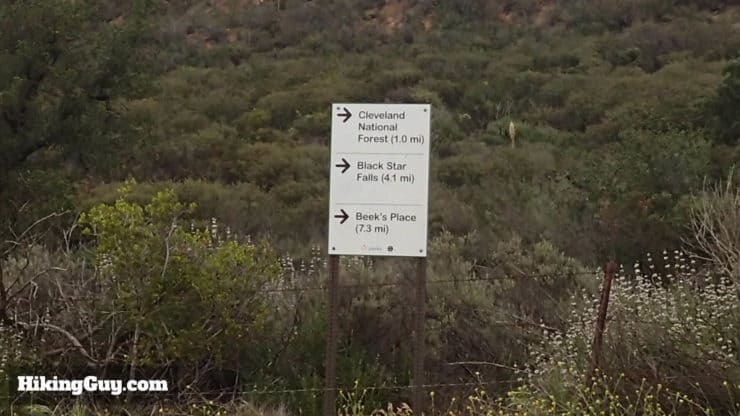 Here’s a closeup of the sign at the junction, with an incorrect distance to Black Star Canyon Falls. The trail is a road here, and is rolling and scenic. Parts of the road go from paved to dirt. You’re still in the right place. You’ll leave OC Parks. Don’t get scared, just go straight. Please respect the property off the road. 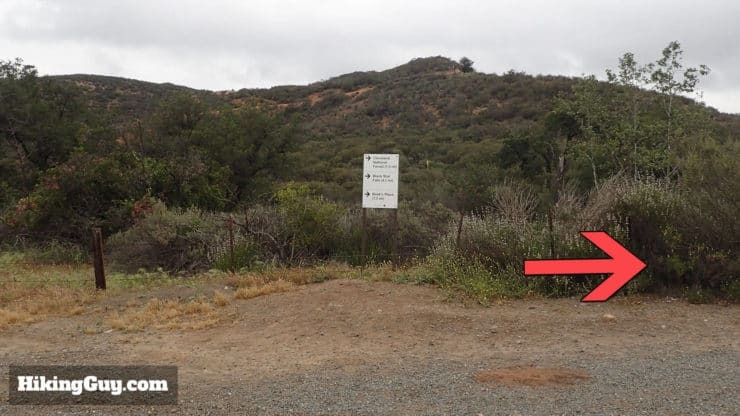 You’ll see a bunch of no-tresspassing signs and electric fences. 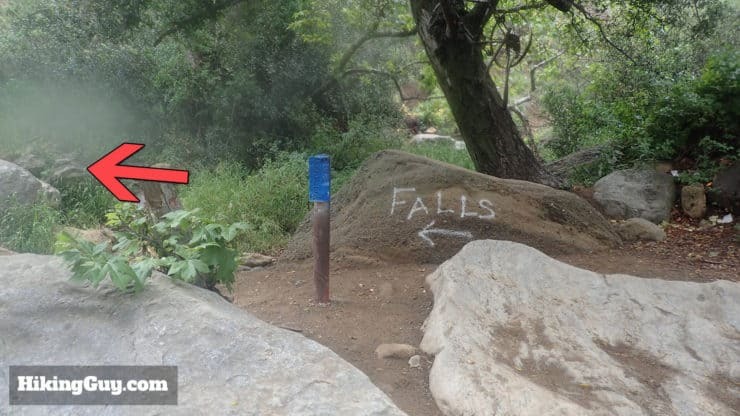 It’s probably just a function of people wanting to keep hikers and bikers from thrashing their property. The road passes over a creek. If it’s a raging torrent, you might have chances of water at the falls. Again, avoid any fences or side trails. You want to stay on the main, unobstructed road. 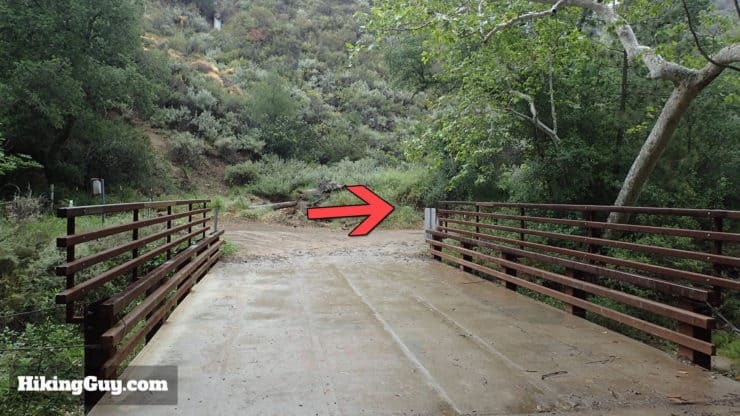 At about 2.3 miles, you’ll come to another bridge. Make the right after you cross. To the left are some old ruins and an old truck. Shortly after that, you’ll come to the most important turn off. 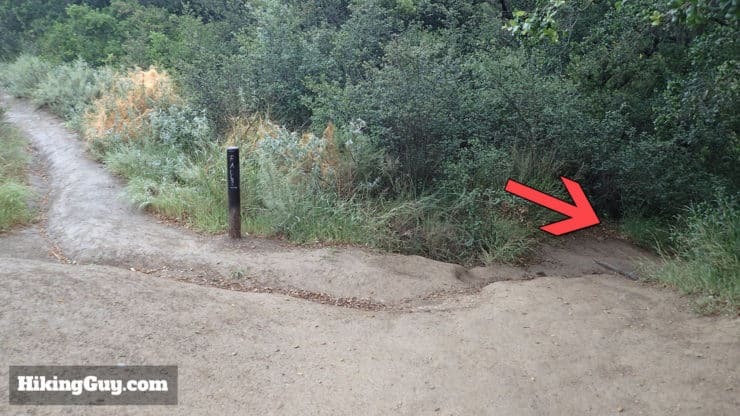 The road turns sharply to the left, but the trail veers off to the right. There’s a metal sign marking the spot. Here’s a closeup of that intersection. Hike the hard right at the metal post. 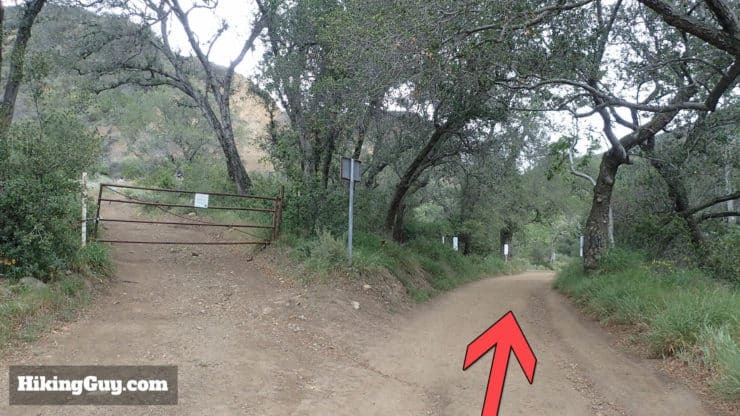 The trail is a steep downhill to Black Star Creek, where you head to the left and upstream. Gone is the wide dirt road, hello stream bed. Start making your way upstream. In the beginning section, the trail is well defined. The trail goes through the stream at some points. 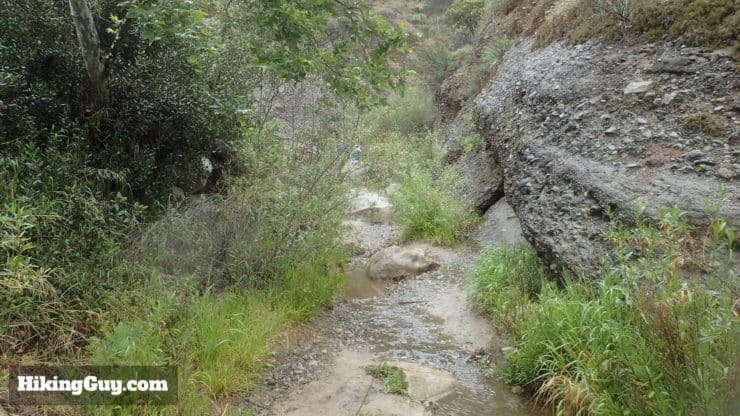 The stream is a lush, evolving landscape, so the trail splits, disappears, and reappears accordingly. This section looks different every time I do it. Again, just follow Black Star Creek upstream and you’re good. At some points the trail veers to one bank or the other, briefly moving away from the stream. After about 3.2 miles, you come to this clearly marked junction. Hike to the left and continue up Black Star Creek. Okay, now the fun part starts. 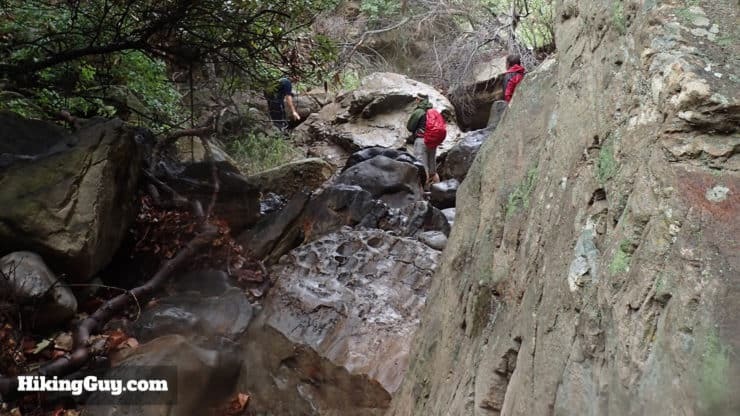 As you make your way up Black Star Creek, there are some sections where you have to scramble up boulders. 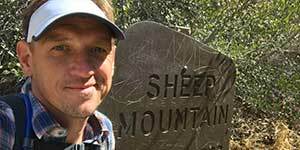 Many hikers have done it before you, so it’s all doable. 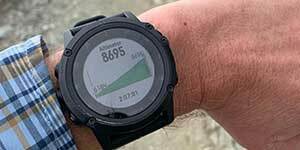 If you don’t know how to make it up, you can always wait for some other hikers to pass you and do the climb, observing how they approach it. 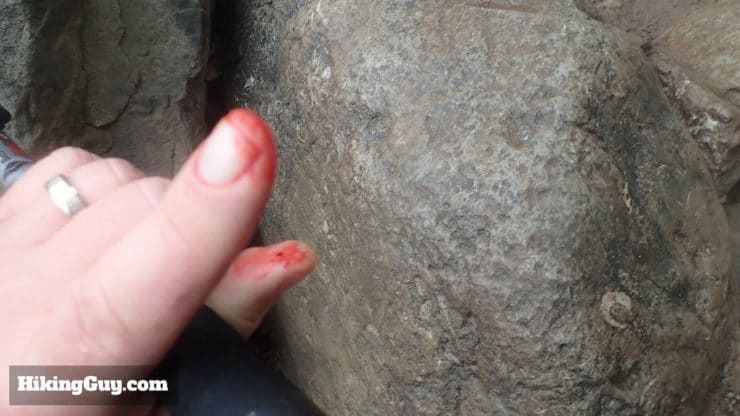 The rocks can be sharp. Many dogs that I see have booties on them to protect their paws. I wasn’t so lucky on this day. One last steep stretch to the falls. 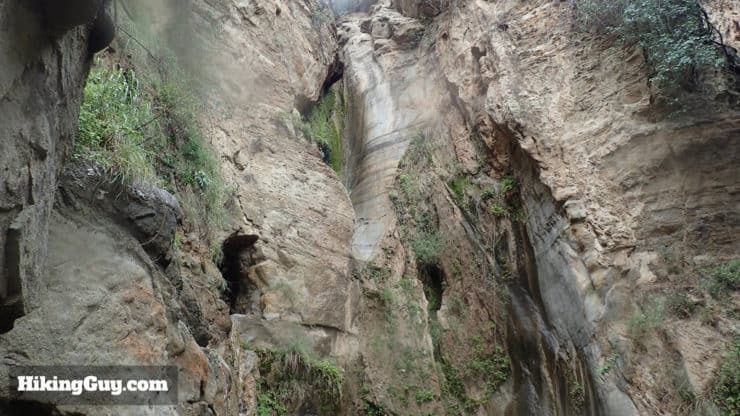 Here it is, Black Star Canyon Falls. On this day it was raining, but the falls weren’t so active. It’s hit or miss, but after a few days of rain your chances are better. The trail dead ends here, and many folks use the clearing as a place for a snack and break. 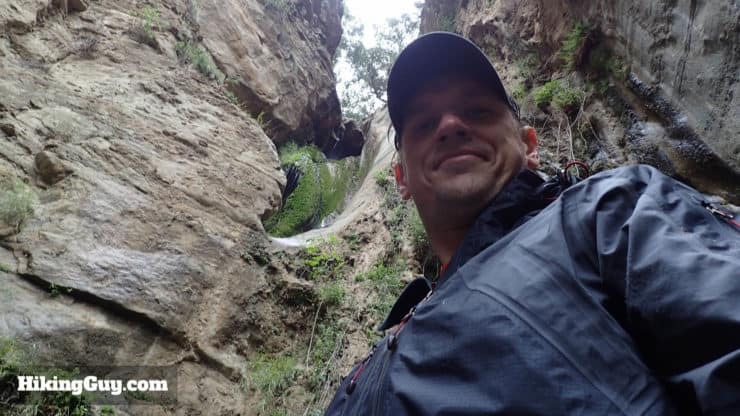 There are some steep side trails that lead above the falls if you want to explore. If you’re comfortable with rock climbing, you can also go into the lower mine shaft. I didn’t, but I’ve seen kids do it. Grab your photos at the falls. Hopefully they’ll be a little more spectacular on the day you go. To get back, simply retrace your steps. Notice the steep drop in this picture, which gives you a better idea of the steepness of the boulder climbs in the last section.